It was a hot and muggy summer morning in the year 52 BC and Gaius Julius Caesar's legions continued their siege of the Gallic town of Alesia. Caesar's Thirteenth Legion defended the southern fortifications of Alesia's total encirclement. The Thirteenth Legion was important for two distinct reasons. First, it consisted of some of the more eccentric units of Caesar's armies, such as Gallic scouts, barbarian mercenaries, and freed gladiators. Second, it was where the Twilight Legion placed it's newer recruits to gain experience in the combating the dark supernatural forces that perverted the ancient world. The Battle of Alesia was coming, and it was feared by many of Caesar's generals, and the great man himself, that the Gauls under Vercingetorix would consider using some kind of supernatural force to battle Rome. Four members of the Thirteenth Legion were brought before Centurion Lucius Vorenus, a member of the Twilight Legion himself, to receive orders for an upcoming mission. Paulus was a Decanus, a unit leader and recent acolyte of the Cult of Mithras. Manicus was a tough and brutal triari, equipped with spear and shield as the last line of defense in combat. Aurelia was a Roman woman who had become a full priestess of Mithras and was carrying secret orders from her High Priestess. Xarax was a Parthian scout, horse thief, and member of the Thirteenth Legion's vaunted auxilia. Vorenus commanded the party to travel to Ateria, a village to the north-west, in order to see if the community was remaining loyal to Rome or if it was planning on aiding Vercingetorix's relief force that was gathering to the west. Accepting the mission, Paulus the Decanus turned to Aurelia to find the secret instructions from High Priestess Cassiopeia. It was a simple statement: "watch for the Lady of the Fang." Going off of the High Priestess' vague document, Paulus led the party to the auxiliary encampment. In a previous encounter Paulus remembered a member of the horse scout team, Voccio, refer to the Lady of the Fang as a war cry. While the auxiliary seemed reluctant to hand Voccio over to the decanus, as their own leader was equal in rank to the Roman, one look from Manicus' crazed face sent the still drunk Voccio outside and into Paulus' presence. Voccio stated that the Lady of the Fang was a myth of the people surrounding Mount Rea, and that it was just a local superstition. Paulus said that the party could use any help, from any gods that existed, and so he commanded Voccio to accompany them as a scout to Ateria. It took but a few hours to ride out to Ateria, and when the party arrived in the sleepy little walled village. Aurelia suggested they split up and investigate the people and their chief, so she and Xarax entered a nearby tavern to collect intelligence while Paulus and Manicus entered the town barracks. In the tavern the two members of the Thirteenth Legion made contact with Correus. A Gallic mercenary, Correus recognized Xarax and started up an immediate conversation with someone whom he considered his equal. Just as Xarax served the Thirteenth Legion against Gaul, Correus served as a member of the Roman auxiliary against the Parthians just a year before. When asked of his allegiance, Correus was back in the camp of the Gauls, and told Xarax that it would be wise to change sides as well, both due to coin and some other cryptic factors. Xarax pressed Correus further but the Gaul didn't wish to speak around Aurelia. Correus bought both members of the Twilight Legion a drink, and headed back into the village. Paulus and Manicus found that there were several dozen wounded receiving aid and assistance in the village barracks. Some of the wounded wore neutral colors, possibly of auxiliaries serving Rome, while others were clearly embracing the colors of Vercingetorix's forces. The chief of Ateria, a man named Segovax, questioned the two Romans as to their plans for the town. When Paulus told the chief that they were simply scouting in order to determine the town's loyalty, Segovax reluctantly admitted that Ateria was on the side of Rome but still would serve as a place of solace for all wounded soldiers, no matter the side. Despite the comforting words of the chief, when Manicus and Paulus searched the rest of the town they became concerned that most of the men and women of fighting age were completely missing. Hundreds of souls were nowhere to be seen, and only the very young and the elderly kept the town's economy and farms moving forward. Interested in taking this information back to Centurion Vorenus, Paulus and Manicus reconvened with Aurelia and Xarax to share their findings. Xarax wanted to spend a little more time with Correus and he sought the Gaul before leaving. Interested in the reasons why Correus favored Gaul's chances in the upcoming battle, Xarax agreed to be led to an encampment in the forest to the north in order to see more clearly. Again splitting the party, Paulus grabbed their scout Voccio and took Aurelia and Manicus east to see if anything of the Lady of the Fang myth was rooted in truth. "You must've done something wrong to be stuck with us!" - Frank to Craig, feeling bad for his Decanus' new crew. "I'm totally playing my character as Charles Bronson!" - Frank reminisces on the Dirty Dozen. "I say we split the party up!" - Melinda just never learns. #GetOutAndGame - 9th World Picnic in White Oak Park! There is no way we could have had a better day than today! Temperatures were in the upper 60's and it was sunny with just a few clouds in the sky. Carrie and I woke up as excited as if it were Christmas morning. Last night was our Norwin Game Knights event, and all we could talk about after spending three solid hours gaming was how we had an incredible morning and afternoon planned at White Oak Park. We packed my Fusion and headed off for our first biking/picnic/gaming combo trip. It was time to #GetOutAndGame! Our plan was to get to the park at 9:30am and then start riding. Carrie and I were set up with our bikes, and we were joined by my good friend from grad school Melinda and her son Dante. Both Mel and Dante are regulars in my weekly Savage Worlds game, but had only dabbled in Numenera. Not wanting to leave her small pup home, Melinda brought a basket for "Archer", her Ratlike Chiweenie who is Carried in a Quiver. After an hour riding we found a great pavilion and set up shop. Our friend Andy arrived not long after I finished explaining the Cypher System rules to Mel and Dante. Domina, a Charming Nano who Commands Mental Powers, played by Melinda R.
Deathstroke, a Weird Jack who Murders, played by Dante R.
It started out simply enough. Vectoria, Rygax, Domina, and Deathstroke were a troupe of roving Numenera hunters exploring the strange domains of the Beyond. En route to Nebalich they encountered the small town of Druissi, a tiny burg built atop an ancient structure which provided heat and warmth to the town through the ground below. While stopping to make some minor purchases of provisions, the townsfolk came to the party and begged them to help with a serious problem affecting the town. The giant structure beneath Druissi has been disturbed by a recent earthquake, and the pleasant and reliable heat that used to seep up through the ground and comfort the medieval town became erratic and extreme. Some days the temperature would be unbearable, and large rifts and fissures began to appear in the structure. One gap was large enough for humans to explore, and the wife of Mayor Geirn, having some skill with numenera and ancient devices, tried to enter the structure but had now been missing for several days. There were others that were missing, but the townsfolk believed that the party looked skilled enough to handle any threats that lie beneath Druissi. The task was simple enough: enter the structure, search for the mayor's wife, and find a way to regulate whatever ancient devices that were causing the recent flux. After collecting the gear and weapons from their aneen the party gathered in front of the largest fissure in the structure. The metal and synth exterior had a single gap almost large enough for a well equipped adventure to squeeze through. Rygax, a rather cautious mlox, projected his sight into the ancient construct revealing that the passage within was relatively safe, and so Vectoria the glaive pushed into the hall ahead. The rest of the party followed, resisting the urge to hold their nose at the smell of rot and decaying plant life. There was a larger opening about sixty feet within the structure, and the party carefully moved down the hall. It appeared that the hall was listing at about twenty degrees and the floor was rubbery and nearly flesh like, while having small glowing lights embedded within. The hall opened into a large mezzanine with a criss-crossed grating covering a large, one-hundred foot long entrance into the twilight of a subterranean jungle. With no entrance in sight, Rygax scouted the area until he found a weird gelatinous panel on the floor. Using a knife as a probe he approached the panel, but when the flesh of his hand broke the vertical plane of the "jelly" the grating retracted allowing the party complete access to the jungle. Vectoria grabbed her rope and tied off to part of the grating that was still exposed. Throwing caution to the wind, the glaive scrambled down the twenty-foot ledge to the dirty ground below. Before Vectoria could react, she was quickly beset upon by a quartet of steel spiders, each seemingly interested in the glaive's flesh! The rest of the party prepared for action as soon as they saw the silvery arachnids. The metal threads that the spiders spun from their abdomen was unbelievably sharp, and as the startled Vectoria stumbled backwards the monofilaments cut through her armor digging into flesh. Deathstroke the assassin wasn't about to let his fellow numenera hunter fall to these disgusting creatures. Grabbing his claw-like yulk the weird jack jumped off the ledge and swung at one of the beasts. Although he hit, and hit hard, the armor of the spiders was most certainly the toughest this party had ever encountered. Rygax chose to stand on the mezzanine and fire at the steel spiders with arrows from his trusty bow. Domina was of a like mind, and after using a cypher that increased the density of her darts, she used her dart-thrower to pelt the spiders with pointy shards of pain. Despite the assistance from her party, Vectoria continued to have trouble with the steel spiders as they surrounded her. Two of the creatures worked in tandem to pull the glaive into a cocoon of sharp metal razor-wire, forcing Deathstroke to work even harder to get to his friend. Rygax would end up using a deadly force emitter on one of the creatures, which was quite effective. As the last of the spiders were being finished off Deathstroke landed what he thought was a devastating blow to a creature, only to realize that he had punctured the monofilament sac on the arachnid, which exploded in his face causing incredible pain and many small lacerations. Once the spider threat was neutralized the party moved deeper into the jungle. There was light coming from above, from small fissures in the ceiling of the structure and tiny glowing insects that flew around. Upon investigating the insects were nearly robotic in design, and could easily pass for either biological or mechanical entities. On the opposite side of the structure the party came upon a large pool of water. Using the weird sensing wires that covered Deathstroke's face (they appeared as dreadlocks of synth that formed a long mane and full beard), the jack believed an important artifact lay beneath the waters to the left while to the right there were voices calling out in pain and agony from the tiny lake. One of the voices was calling out for "Geirn." Using his far-sight ability, Rygax saw that there was a small clear disk in the water about forty feet to the left, and so he jumped right into the water, not caring that as soon as he entered the pool the voices stopped. He made it to the disk easily, and pulling it from floor of the pond he turned to the rest of the party quite excited, only to find himself facing a gargantuan mesomeme! The enormous crustacean, adorned in the talking heads of it's former prey, immediately unleashed it's claws on Rygax. The mlox was grappled, and had to change phase with a cypher to escape and swim away from the mesomeme. Deathstroke swam out to help his fellow jack, and even managed to scrape the mesomeme with his yulk several times but the armor of the monster was nearly impenetrable. The claws of the creature found the weird jack as its next source of prey, but luckily a well thrown choking gas bomb from Vectoria caused such great pain to the mesomeme that Deathstroke was able to get away. Injured but still a serious threat, the mesomeme turned to the rest of the party, especially Vectoria who had just turned on her shroud of flames, which burned the crab-like beast when it tried to grab her. Both Domina and Deathstroke decided to use a pair of powerful cyphers to finish off the mesomeme. Domina's idea was slow acting, but interesting, as she used a cypher to start growing a tree near the pool to ten times it's size. The plan was that the roots of the tree would penetrate the stone encased pool, draining the water and possibly causing injury or death. Deathstroke's plan was a bit more shocking. Just as the mesomeme attempted to attack Vectoria again, Deathstroke used his lightning wall cypher in the water, giving the crustacean a truly electrifying experience. A few more darts, bolts, and arrows dropped the creature into a watery grave. Taking the small disk, the party decided to leave the structure and head back to Druissi. Hopefully they could rest up, learn how to use some of the new cyphers that they found at the bottom of the mesomeme's pool, and prepare to further explore this strange and mysterious ruin. There's a whole world out there… go roll dice in it! Get out and game. Literally. The summer is almost upon us, you've been cooped up all winter, and you could probably use the fresh air. I know we are all gamers, and our choice of hobbies may seem to limit us to basements, game rooms, and living room floors, but my goal for the summer of 2014 is to do a complete turnaround on the stereotypical scene of a game-master at the head of a dining room table leading their player's through a typical dungeon crawl. I don't need to share with you the benefits of getting outdoors and exercising. If you have been gaming as long as I have I am sure you got your fill of the American Heart Association ads that used to be plastered all over Dungeon magazine back in the 90's. So I'm not going to soap box about the health benefits, but instead offer you and your players the chance to create a special moment in your gaming career that you will never forget… just by a little change of venue. When I was in middle-school in the early 1990's I spent every possible moment that I could playing Dungeons & Dragons and other role-playing games with just about anyone who would be willing to play. Given the nature of my blog, and the cross-section of the population who would even bother reading what I write, I believe it is a fair assumption that many of you out there had similar experiences during your formative years. I can't remember specific sessions very well, only big special events really. For example, I can't remember all of my games during a short-lived AD&D 2nd Ed. Dragonlance campaign, but I do remember the night my mom generated a dwarven fighter/thief and decided to team up with my little brother's tinker gnome. I've been known to run Ravenloft through all editions of D&D, but those games where we went all-out "gothic" with candles, red sheets draped over lamps, and weird incense burning in the background sure made the Domain of Dread especially terrifying. A fan of Wendy and Richard Pini's ElfQuest comics, I've dabbled in Chaosium's ElfQuest RPG on many occasions, but I'll never forget my brother and his wolf-companion exploring the troll caves while we sipped soda and ate peanuts in the lounge car on an Amtrak train with several onlookers pondering what exactly those two crazy kids were doing. It's incredible to experience these special moments in our gaming careers when it wasn't something in the game that made it memorable, but the context or venue in which the game was played. As a gamemaster, I am constantly searching for new and exciting ways to express myself and my story while behind the screen. I am certain that I am not alone in this quest. This past February my two daughters, wife, and mother all agreed to be part of a special experiment during our vacation to Walt Disney World in Orlando, Florida. 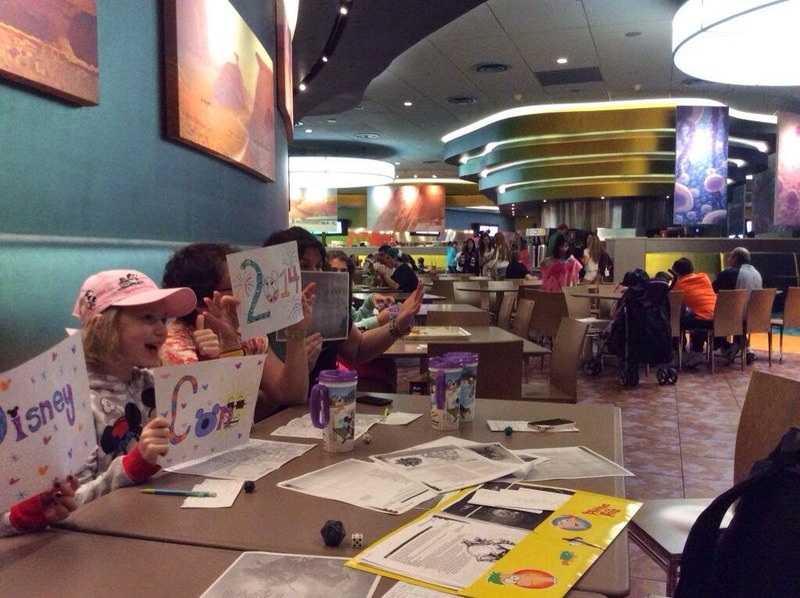 Using Disney-themed characters, I ran a session of my Numenera campaign in the main dining area of Disney's Art of Animation resort at 9pm while many of the dinner crowd were still enjoying their meals. This being a casual cafeteria type dining experience there were tables available, and we figured that as long as we were eating and drinking no one from Disney would take issue. If you are interested, here is the play report! The adventure was short but action packed, and we even had a few onlookers interested in what we were doing, although no one approached us directly. I was incredibly nervous at first and felt very much on the spot. I've run games in public before, both at conventions and during community gaming events, but that was in front of other gamer-geeks, not the general civilian population! We had a great time, and I hope that when my two daughters look back on their own personal gaming careers they never forget the (first) time their dad rolled dice with them at Disney World. So I started off this conversation with a picture of a bike, and I have certainly taken the long way to get to the point of this blog-post. I want to have more "adventures" while I am adventuring with my family and friends, so I have decided to take my game on the road wherever possible. For me, my family, and any of my friends who are willing to step outside of their comfort zones a bit, my challenge is to spend a significant portion of the summer of 2014 not only gaming in public, but also doing it outdoors. 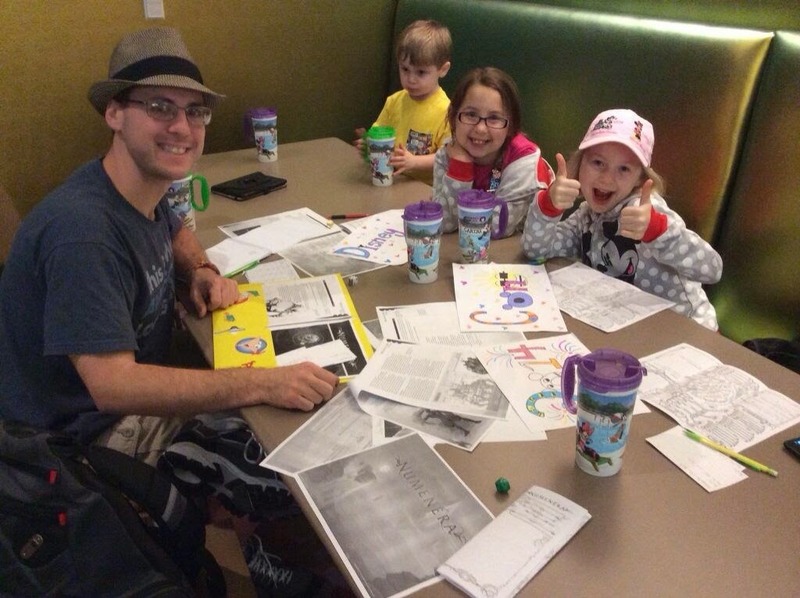 Playing pen and paper role-playing games is awesome - this is a well known fact. Well hiking and biking are also fantastic, so let's combine them! Heck, I haven't camped in well over a decade, but I bet playing a horror-filled scenario around a campfire would create a special moment that you would never get at your mom's kitchen table. My plan is simple. This Memorial Day weekend I'm going to grab my oldest daughter, a few friends, my Numenera books and set out for a local park for some bike-riding, a picnic, and then an awesome gaming session. We might get rained out, we might get bit up by mosquitos, but it will be a special moment that we will always remember. If it's awesome, we're going to do it again, and again, through the entire summer and fall. And I think it would be especially amazing if some of you all came with us, both literally and "in spirit!" I didn't see anyone else using the hash tag #GetOutAndGame, so let's claim it for nerd-kind and get some pictures posted! Hike through the forest and end your day with s'mores and Planescape! Do a 20km cycling trek and wrap up with a coffee shop game of Pathfinder! Do something and play something and make sure you let other people see you do it! I'm off to go prep for our adventure… who's with me? Whenever I write a game I like to have a firm understanding of the setting's backstory. What came before the campaign, and how does it connect the player characters to the setting? In any great published setting there is an amazing story that gives the game master fuel for dozens of story arcs, plot lines, and character development. I am trying to share this idea with Carrie, and although I don't believe the two of us are capable of writing out pages upon pages of backstory, I feel it important in any setting to at least put on paper (or on Word/Pages) enough detail to create a "canon" from which all of the game's stories can flow. The advantage to writing a homebrew setting, rather than trying to publish material for other users, is that you only need to write enough to spur your own imagination, and since the world is "yours" you can change it whenever you want! Despite advancements in science and technology there is little remembered about the original humans who entered the Sidon system nearly five thousand years ago. What is known is that the first humans, who originated from a place called Ethar, jumped into this magically enhanced planetary system through a similar wormhole-like anomaly that would later summon the Husk. The histories state that the gargantuan human craft hailed from the gargantuan "Spiral in the Sky", the galaxy that rises and sets like the Sun, Sidon, and the rest of the moons. [Thank you to Fox's Cosmos for this idea! How such great distances were traversed is still unknown. The technology available to the original humans suggests that although they jumped such an incredible distance through the vastness of space, they never expected to come quite this far. Immediately upon entering the Sidon system the massive human craft (which the histories state resembled an enormous disk) lost control, fell towards Sidon, and was gravitationally flung at high speed towards the second moon of the system, which would come to be called Agreon. The histories state that most of the humans who crashed on Agreon did not survive the first day. The force of the impact, despite emergency landing procedures, and the vastness of the craft itself lead to many of the explorers getting trapped within the ship's corridors. A quick thinking lieutenant named Cam Zaen managed to make it to the surface with several hundred other survivors. Zaen spent the next several weeks making forays into the doomed saucer, pulling out more survivors, pieces of broken technology, and raw materials. The weeks turned to months, and although no more living souls were found on board, the massive craft had incredible stores full of seeds, eggs, and animals held within suspended animation. Using all available resources Zaen began construction of a colony which he named after his mother: Zama. Cam Zaen had full control over the military forces that were available at the time, and his dictatorship, while fair, would set a totalitarian precedent for future dictatorships within the fledging government. After Cam Zaen's death, Zama was declared the capital of a much greater nation: Zaenaan. Although the early humans placed little emphasis on the histories of the past, they became great scavengers, adopting as much as they could from the "People of the Disk," that were then long dead. A scientific caste arose within Zaenaan's civilization, wielding the great powers of the past with little regard for the rest of the culture. For many within the scientific caste, the advancement of technology would be the ticket back to their ancestral home. There was a growing movement however, amongst the scientists that believed it was their place to colonize Sidon and it's moons and give up on any attempt to recreate the technology necessary to return to humanity's ancestral homeworld. One of Cam Zaen's grandchildren, Tennor Zaen, was in power at this point, and he himself became a fervent "Agreoni", the name the movement took for itself. Tennor Zaen commanded all research to be focused on only the necessary technologies to finish colonization and terraforming of Agreon. This "Agreon First" policy angered many of the scientist caste that still felt it their duty to try and bring humanity home to Ethar. Zaen had the support of the people, and those scientists and their families who spoke out against the government of Zaenaan were often sent to a penal colony on the opposite side of Agreon. "Go back to Ethar" was a common graffiti at the time, splashed across the conveyances, homes, and businesses of those who wanted to return to the human homeworld. Goethar became the name for the penal colony, and as Zaenaan reduced it's population of rebellious scientists, the government didn't realize that they were growing their greatest rival. … To be continued with the Goethar Science Rebellion! One of the reasons that I love Savage Worlds is that there are these incredible Setting Rules that game masters can use to customize their campaigns! For Aether's Light I wanted to play around with a new Setting Rule that could be useful for those attempting to follow our footsteps, or just as a new modification to your own campaign. Most D&D players remember Dark Sun, an awesome post-apocalyptic fantasy setting from the early 1990's by Tim Brown. The setting was revived with D&D 4E, but without one of it's most iconic features: Character Trees. Since Dark Sun was such a dangerous and brutal setting, each player got to create up to four characters to have on their "tree", and shared experience, alignment, and possibly even treasure with one another. If one character died, another could be called up for duty. It was a great way for players to customize game play as well help them not feel like they were starting from scratch when a beloved character died in the sandy wastes. Each player in Aether's Light will be allowed to create two characters at Novice rank when the campaign begins. Players can only control one character on an Away Mission at a time unless special circumstances call for all of the characters to be in the same place. This should be reserved for exceptional situations. Game Masters are encouraged to switch back and forth between the two characters for scenes that could be going on concurrently both on the ground and in the craft orbiting above. Experience points are earned for both characters as the game progresses, but the GM should give more experience points to the player character that is exposed to the most danger during a mission. Often this will be the character taking part on the Away Mission, but possibly it could be the character on the ship if the story takes an unexpected turn. Equipment, and gear can be shared between the two characters, as well as with the rest of the party. If a character dies, a new character can be created with 5 experience points less than the "departed" PC. We are still working on the history of Sidon System. Carrie's focus is still the Lunarians, and you will read in her section that she's already started writing fiction for the Magic Marauders. We still need to detail the rest of the species. On Wednesday evening we went through the Savage Worlds Deluxe core book, Fantasy Companion, and Horror companion to catalog all of the official powers so that we could start splitting them up amongst the different types of spell casters. Finally, expect to see more history as we do our write ups for Goetha and Lune! This was probably the best story I've written so far!!! Anndrian was a Lunarian in the olden days, when Lune was close to Sidon. Anndrian was a special Lunarian because she could tell the future. She knew that the Husk was going to send them flying, but she never told anyone. Not until one day, four days before the Husk incident. She took her large lizard (the LiZard) out of his pen and put on his LiZard saddle. The saddle was specially designed for the LiZard's back so it is comfortable for the LiZard and the rider. Anndrian then hopped onto the LiZard's back and kicked it's side. The LiZard heaped forward and off they went. When they got to the town of Grutende, Anndrian jumped off the LiZard. She ran to the Mayor's home and knocked on the door. Anndrian looked at the door and said, "I need to announce something to the world, and you're the only person that can help me with that. You have a speaker in your office that goes through all of the world's speakers. May I come in?" Anndrian heard a beep on the intercom, BIG STOMPS down the main steps, and the door opened. "Come right on in," said the Mayor. Anndrian walked into the mansion and walked to the room that said OFFICE on the sign next to the door. Anndrian walked into the room and sat on the swivel chair. She spun the chair around till she saw the microphone, and then stopped. She picked up the microphone and turned it on. Anndrian spoke with a smooth, clear, calm voice. "Attention, all Lanarians. It is me, Anndrian. In four days there will be a force called the Husk that will blast us far away from Sidon. Please take a minute to collect yourselves and your belongings, and then make your way to a safe place. Please bring enough food and water to last you a good long while and things to keep you busy. I would say to also bring something to tell you when it is okay to go outside again. Thank you." Then she turned off the microphone, and went home, to do exactly what she just said. Dungeon Magazine holds a special place in my heart, especially the issues that were released in the early 1990's. I first started playing D&D in 1991 and it only took a few months before I picked up the necessary books to run my own games. Although I started with a used Red Box and Blue Box for Basic D&D, I soon found myself at Toys R Us and my Mom bought me an AD&D 2nd Ed. Player's Handbook and Dungeon Master's Guide. At first I didn't have a Monstrous Compendium, but I did have a few Dungeon Magazines in my possession, used of course, that had stats for monsters. Over the years I collected quite a few Dungeon Magazines, and even had a brief subscription for a time. I loved the adventures that I found every two months, and one of my favorites for entry level characters was Below Vulture Point by Jeff Fairbourne. Here I've taken that awesome quest and plopped it down in my favorite D&D generic setting, Dragonlance for a one-shot romp with four friends and two of our children! The road from Haven to New Ports is perilous and fraught with danger. Bandits, robbers, and monstrous humanoids plague the route that directly connects Haven to the New Sea, and in recent months the salt fish trade has completely stopped. But while these threats are the bane of merchants, for adventurers this simply means more opportunity! Seeing a posting at a local tavern in Haven, the elven mercenary-for-hire Tris and her expert team of five cutthroat adventurers gathered together and prepared themselves. This particular posting spoke of the mysteries of Vulture Point, a monolithic tower shaped by time, wind, and weather giving it the appearance of a great bird's head. Rumor had it that the great bird head, hundreds of feet high, was the source of all evil plaguing the road from Haven to New Ports. Evil giant bird head? Perfect quest for a group of newbie adventurers! Tris looked into the eyes of her team, pounded her fist on the table and exclaimed: "Dudes, whole bunch of cash if you come with me!" That's all it took to motivate her squad of death-dealers, and so the party set off fort for New Ports, hoping to be assaulted by whatever infested the road, and bring glory to their names. The first part of the party's trek was a lesson in how not to make your way across Abanasinia. Only a few miles outside of Haven the six adventurers came across a poor beggar on the side of the road. Asking for anything that the characters could spare Merric, a cleric of Paladine, approached the poor man and handed him a silver. Overjoyed the beggar threw himself on the cleric, thanking him profusely. About a half an hour away from the scene Merric reached his hand down and realized that the street-rat must've robbed him, as there were ten gold pieces missing from his belt pouch. Served him right for doing something good and just! As the party neared a point where the light forest opened up to a coastal ridge of hills, another day down the trail, Tris felt a cold feeling run down her spine. Taking a look around, Tris lead Lenny and Frodoganji to the left of the path while Ralf Redarm and Nicole Slawbottom moved to the right. Merric stayed in the center of the road solemnly in prayer. Ralf and Nicole made first contact with the kobolds that were preparing to ambush the party. Ralf was able to block the initial attack, and backed up by Nicole's sharp aim with a hoopak, the pair was able to dispatch their humanoids with ease. Tris, Frodoganji, and Lenny had a bit of a more difficult time. While Frodoganji's arrow took down one of their attackers, the last remaining kobold ran deeper into the woods causing Tris to make chase. But only a few hundred yards down the path the elven fighter/magic-user fell into one of the kobold traps, a pair of poison sacks that clacked together causing a horrific cloud of throat-choking agony. Tris collapsed in a heap and was just barely brought back to the world by one of Merric's potions. The pain would continue when the party found themselves in the rolling hills just outside of the giant monolith. Vulture Point was a massive rock formation that jutted out of the ground nearly nearly two-hundred feet. Aside from the fact that Vulture Point resembled the beak and head of it's namesake creature, dozens of the carrion birds made their home in the mouth of the monstrous form. Trying to figure out a way to approach, Frodogenji picked up one of the kobold bodies collected during their last encounter, and held it out in front of his own body. The human fighter hoped that the body would mask his appearance, but given his lack of math skills, didn't realize that the three foot tall kobold couldn't cover his six foot frame. So ten vultures descended upon both the dead kobold and Frodogenji as well, nearly killing the poor fighter. Lenny was able to use a Flare spell to scare most of the creatures off, while Tris' arrows did the rest of the work. Merric shook his head as he had to heal yet another member of the team. Ascending the head of the monolithic rock formation was relatively easy until the halfway point where Nicole came across a tripwire. Another danged kobold trap! Although she tried disarming the device, she was unsuccessful, and so she just hopped over the string with ease. Lenny wasn't so nimble. The human wizard tripped the wire causing a rock slide to cover his body. Knocked out, Lenny had to wait for the party cleric Merric to bring him back to the world. The rest of the trek up to the mouth of Vulture Point was rather simple, but at the top of the walk, right in the mouth were flocks of vultures, all looking for a meal. Nicole tried sneaking into the area with a torch and tinderbox to burn the birds out but was nowhere near sneaky enough to get through undetected. While the bird started to peck at the kender's arms and legs Lenny managed to cast a sleep spell on the rest of the vultures, putting them all to sleep. There were two paths ahead, both leading into the caves below. The party chose the tunnel that led directly to the lair of the kobolds, who were commanded by a diminutive, yet deadly urd! As soon as the party entered the lair, ten kobolds attacked with daggers, while the urd threw a burning stone bomb right at Lenny, knocking the magic-user out of combat for the rest of the encounter. Earlier in the quest, Ralf found a potion of cold dragon's breath on one of the kobolds, and used it to freeze half of the kobolds in their tracks. The urd summoned a giant vulture to appear directly behind Merric, forcing the otherwise pacifistic priest to pull his mace and shield and start defending himself. While Tris and Frodoganji fired arrows at the remaining kobolds, and even managed to knock a couple out, both would fall to the brutal attacks of the little dog-headed humanoids. Merric was able to tackle his vulture problem with relative ease, turned his mace on the rest of the kobold crew. Once the urd was defeated it wasn't long before the other kobolds fell. Tris, Lenny, and Frodoganji all needed significant healing… a cleric's work is never done! After getting the party back to a somewhat healthy condition, Merric gave Frodoganji the okay to go back to work, and the human fighter went about working with Ralf to grab as much loot as possible. A billion years beyond "once upon a time" the Three Princesses of Nihliesh were still trying to get their bearings. The trio had just been teleported over a thousand miles from the Caecilian Jungle following their expedition to the Temple of Jruve. In front of the three was Kermite, the frog-man riding atop a large toad-like steed, and he said that he needed help. The son of the Frog King and the Temple of the Frog (yes, his claim was that the Temple was his mother), Kermite told the Princesses that he and the rest of his siblings had been banished from the Temple of the Frog, hidden deep within the jungle. The Frog King was a jealous man, and so whenever the Temple "laid" a new Frog egg, the king quickly sent it away to try to survive on it's own, from a curious little tadpole-thing to maturity. Well Kermite the Frog Prince had enough of his father's ways, and pleaded to the Three Princesses to join him in a quest to return to the Temple and convince the King to change. After agreeing to join Prince Kermite, the frog informed the party that the first part of their trek would be to cross the dreaded Swamp of Everlasting Stench. Many years earlier a failed experiment by a deranged Nano unleashed trillions of twisted nanites into the swamp's waters with the ability to create permanent chemical imbalances in the sweat glands of humans. The result of coming in contact with the water was clear: eternal stench. Kermite and his steed were not affected by the swamp's waters, but Elsa, Anna, and Merida needed to figure out a safe way across. So the women sat down and devised a plan. Each princess would figure out a way to cross a third of the swamp using a special skill or talent, and the other princesses would follow. Merida started by climbing up some of the vines and swinging from tree to tree for the first leg of the trek. She was rather successful, and her path was fairly easy to follow so Anna and Elsa had absolutely no problem making their way. Merida's skills at identifying plant life told her which lily pads the party could use to support their weight, and Elsa's skill at balancing made her the perfect candidate to try leaping from pad to pad. Again, two of the princesses followed behind, with no problems. The last leg was over open water, still reeking of foul odor. The princesses had made it this far, and they had no desire to smell for all eternity. Anna had all sorts of strange skills in her Jack mind, and one of which that she pulled from her memory was how to create a raft. Just before the open stretch there was a hollow log that Anna quickly patched up and lashed branches to using rope from her explorer's kit. The raft worked for part of the trip across the water, but then started to sink. GM Note: There was a point here when Evie started to tear up. She was so afraid that the characters would all stink forever, and that it would be Anna's fault. She rolled a 1 on her Intellect based crafting check, and I ruled a GM Intrusion. Rather than give the team a side-quest to deodorize themselves, I allowed the intrusion to be the giant beast. "Awww… poor Froggy!" - Evie felt really bad that the Kermite was banished from the Temple of the Frog. The Science Fiction Companion Update! Since our last post we've had a couple of updates, several of which are linked to my recent purchase of the Savage Worlds Science Fiction Companion. What a phenomenal book! With updated rules for creating new races and species, robots, mechs, ships, and creatures, Carrie and I should have no problem picking and choosing what fits best in our setting and what should be saved for future campaigns. We've also updated the name of the central gas giant planet from Aether to Sidon. I thought that Aether, while not original as a term, was still a pretty cool name for a magic-generating planet. Well, I booted up Metroid Prime 2 this week, since I own it but have never played it, and found out that the planet in that game is called "Aether." Oops! For the last two weeks, however, I've been playing in a friend's Numenera campaign. If you have never played Numenera, it is a phenomenal game system and campaign setting by Monte Cook Games. In my friend Jeremy's campaign I play Sidon-Barrex, a Lattimor Jack who Entertains. Since Lattimors are a symbiotic species, with two separate aliens merged into one, each "side" has it's own name and personality. Sidon being the outgoing charismatic aspect of the character, I thought "Sidon" was a great name for our world. Who knows, maybe the name Barrex will show up somewhere else, as it is well known that I enjoy Easter-Eggs in my pen and paper RPG's! We are still going to refer to the setting as "Aether's Light", with the term describing the effect the planetary glow has on the rest of the system. Carrie and I have agreed upon all of the positive and negative racial abilities/traits for our six starting races/species for Aether's Light. While we have only featured background information for the Inkami and Ajordo so far, we chose to share the details for all of our playable creatures here in this post. You'll see that we've made a few changes to the Ajordo to reflect some of the awesome traits that we found in the Savage Worlds Science Fiction Companion. Lunarian (Lune-Native Human): Adaptable, Low-G Worlder, Start play with a d6 in chosen spellcasting skill. Carrie and I have done quite a bit of work on the Grelth/Growler species so far. We know that they are a mercenary race that lives on the very large moon of Bolera and that originally Goethan colonists clashed with the Grelth as their holdings expanded. When Zaenaan set their eyes on Bolera they used the Grelth as pawns, aiding the "Growler" race against their common enemy. Once the proxy war was over, however, the humans of Zaenaan didn't leave, and instead absorbed the Grelth nations against their will. We have several pictures drawn of these warrior-pups, both from Carrie and myself. But how great would it be to get a real model for these pictures and do a photo-shoot? 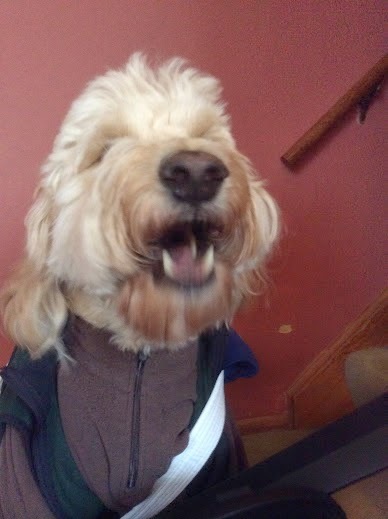 Our five year old Goldendoodle Ridley (so named for the second boss in Metroid) was more than willing to volunteer to stand in as the first "Alpha" of the Grelth people! Battle Armor Alpha ready to defend his cohort! First I have to thank +Richard Woolcock for directing me to Savage Arcanum and +Kristian Serrano for giving us some excellent creative feedback that led to how we wanted to manage "spirit" magic! Savage Arcanum is a fantastic fan-crafted resource that allows GM's to create new and exciting means of spellcasting. I know that we wanted to create something new and interesting for Aether's Light, but also that there had to be a careful balance so as not to topple the Savage Worlds system mechanics. Our "Arcane" source of magic will fuel what we are right now calling a "Draw Method" (an homage to Final Fantasy VIII) and the "Primal" source a "Gaia Method". Obviously both systems need to be subjected to the rigors of play before we could attest to how the rules stack up against other characters, but at lease we have a starting point. In the Aether's Light campaign setting arcane power comes from one of two sources: The Aether generated by Sidon and it's rings or the Marrow mined from the dark and ominous Husk. There will be two separate lists of powers, one for each source. Players must choose whether or not their character starts play as an Aetherite Caster or Marrow Caster. The player receives a -2 penalty to casting a power from their non-preferred power type. Characters begin play with their 3 powers (all from their preferred power source), but also gain 1 additional power in something called a "Draw Slot". Characters gain 1 additional draw slot at each rank of play. Characters can fill their Draw Slot in one of three ways. First, when a character defeats an arcane opponent the character can Draw their choice of power as the Aetherite or Marrow dissipates from the opposing spellcaster's body. Second, a spellcaster can choose to give up the power in their Draw Slot to another spellcaster, either by choice or intimidation. Finally there are places of magic throughout the Sidon System where a player can draw particular powers. The character is still limited in that the power drawn must be available their Rank. Also, powers can only be drawn from other Magic casters, not Gaia Spiritualists. The Draw Slot can be filled with an opposing magic type (an Aetherite Caster can draw a Marrow power), but would still be subjected to the -2 casting penalty. Additional powers gained through edges may be fueled either by Aetherite or Marrow, again keeping in mind the preferred power source. As per Savage Arcanum a player must have a "Spell Focus" created from either Aetherite or Marrow to cast their spells. Typically this is a piece of material mounted in a staff, rod, or gauntlet. Casting without the Spell Focus is an additional -2 penalty to Spellcasting (on top of any penalty based on the power source). Switching Spell Foci is just as difficult as swapping weapons and would require an action. Each world of the Sidon System is home to a particular Gaia Spirit [Name subject to change], as each world is "alive". There are those that can channel this type of spiritual power, gaining access to the native powers of the world to use in order to protect or subjugate the weak, to heal the friend or hurt the foe, or just to better oneself for a particular situation. The spirits of each world are not good or evil, although powers may be wielded for any cause. Those that channel the might of the incredible entities don't rely upon religious fervor but strength of will and attuning to the spiritual forces that flow throughout the world. This does not mean that many people, such as the Inkami, do not turn this manner of casting into a type of religion. The Gaia Method of spellcasting is nearly identical to the Miracles system found in the Deadlands Player's Guide. Each world has it's own power list to choose from and the character has access to all of the powers at any given time. Since much of the action in Aether's Light takes place in the far reaches of space, when a character is traversing the heavens they can actually draw from the incredibly powerful Gaia Spirit of Sidon itself. This has it's own power list, but the drawback to breaking the connection is much more dangerous. Should a player roll a "1" on the Gaia Ritual die, regardless of the wild die, they are Shaken and take 1 wound. Naturally if they are already Shaken they take 2 wounds. In our next post I plan on discussing a bit more about history and driving political forces of our setting. I'm injecting a bit of a history lesson about colonialism/imperialism for Carrie by setting up the human species as both the main heroic people as well as the principal villains. We'll be working on brief write-ups for all three of the major human nations, Zaenaan, Goetha, and the Lunarians. We also hope to go into some more details about the setting rules that we've thought would work best for the game. We're also looking for feedback on what to call the Draw and Gaia systems and their spell casters, so please feel free to leave us a comment below! I remember on Friday I asked the class who liked RPG games, and boy, was I surprised with the results! I remember looking at 11 hands pop up, and I wanted to faint. Me and dad are still deciding on three people, but I think this will be amazing when it's done! Dad will also get to bring some grown-up friends to play as well. Go, Aether's Light!! !